12 new costumes are coming to Marvel vs. Capcom: Infinite as DLC on December 5. The premium costumes finish out the 30 planned premium costumes that can be obtained in the $29.99 Premium Costume Pass. The new costumes are for Rocket Raccoon, Gamora, Nova, X, Zero, Strider, Ultron, Thanos, Spider-Man, Frank West, Haggar, and Jedah. They can also be bought individually or in separate packs. The first pack is called the Cosmic Crusaders pack, and focuses on heroes that battle foes across the universe. New costumes for Rocket Raccoon, Gamora, Nova, X, Zero, and Strider are included. Gamora’s outfit in particular is a throwback to her days before joining the Guardians, and X’s costume was previously a concept art design that was never used in a game before. The second offering is called the Stone Seekers costume pack. It includes new costumes for Ultron, Thanos, Spider-Man, Frank West, Haggar, and Jedah. Spider-Man’s costume in particular is cool as it’s the Superior Spider-Man (Doctor Octopus). 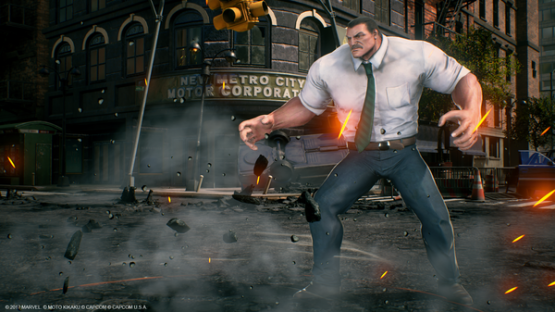 Meanwhile, Frank West has a hilarious Proto Man outfit, and someone finally got Haggar to wear a shirt. Like many other Marvel vs. Capcom fans, I was slightly concerned about the character roster of Infinite. Despite not having missing some big names like Wolverine and losing some of my favorite characters in 3 (I miss you Phoenix Wright), I still found plenty to like about its 30 characters. New additions like Captain Marvel are a blast to learn, and I never felt like I was limited in my character selection. It’s a diverse roster filled with fun to play characters, and it’ll only get stronger when DLC characters like Black Panther and Monster Hunter get added in the future. It ultimately doesn’t matter if you’re upset with the roster, because at the end of the day Marvel vs. Capcom: Infinite is a great way to spend a night with friends. The combat feels smooth, the depth is there for dedicated players, and it’s a much more feature-complete offering when compared to the launch version of Street Fighter V. There’s a ton here to like, and those who dismiss it will only be missing out on one of Capcom’s finest fighting games. Marvel vs. Capcom: Infinite is available now.